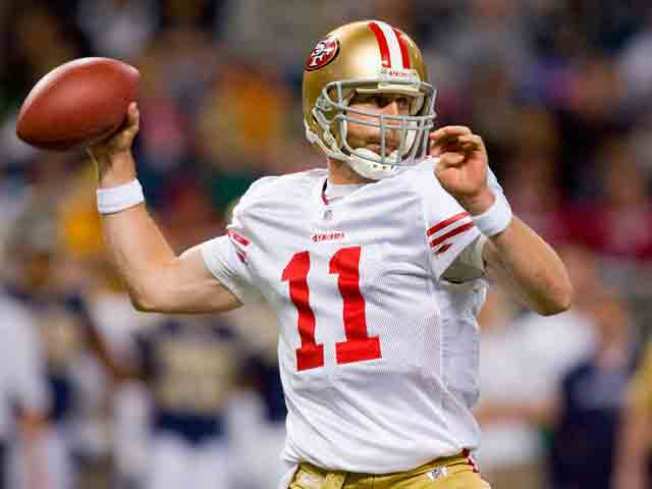 San Franciscoquarterback Alex Smith has left the 49ers' game against Carolina in the third quarter after spraining his left shoulder on a sack. Smith was driven to the turf by Charles Johnson on San Francisco's first possession of the second half Sunday. He immediately winced in pain and remained on the ground for several minutes. Smith then got up and walked to the locker room. Former Panthers quarterback David Carr replaced Smith in his first appearance of the season. The 49ers said Smith would not return. Smith, who entered the game with an NFL-high nine interceptions, was 9 of 19 for 129 yards, one touchdown and no turnovers before leaving with the game tied at 10.